For the first time with Digital Copy, this Mickey Mouse Clubhouse DVD is ready for the summer fun and on-the-go adventure! Available on May 24th, Mickey Mouse and his famous pals (Minnie, Donald, Pluto, Goofy and Daisy) join efforts to inspire preschoolers around the country to enjoy the outdoors by camping, fishing and exploring nature in Walt Disney Studios Home Entertainment’s latest DVD release, Mickey Mouse Clubhouse: Mickey’s Great Outdoors. 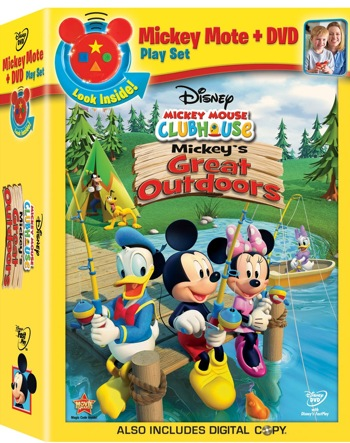 As a great value for parents and a fun, portable play set for kids, Disney has packaged Mickey Mouse Clubhouse: Mickey’s Great Outdoors to include a DVD, a Digital Copy and a Mickey Mote –making this the ultimate Play Set. The Mickey Mote (a child-friendly handheld remote control) provides hours of interactive fun that allows kids to engage with their favorite Mickey Mouse Clubhouse characters while watching Mickey’s Great Outdoors. And the Digital Copy allows parents to download all the episodes onto a secondary device for easy, portable on-the-go access. safari and explore new territory to find this legendary flower. literally carried away along with Minnie and Pluto, who couldn’t hold her down. lighthouse), and a Toy Hammer (to fix the Ferris wheel). • Daisy’s Grasshopper - Daisy has a new pet grasshopper named Wilbur, but the playful hoppin’ fella hops away – and we help all our Clubhouse friends hop after him and find him before the end of the day. Boing-boing! 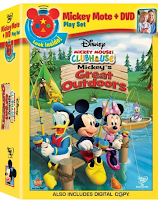 WIN: 24/7 MOMS and WDSHE are giving away a Mickey Mouse Clubhouse: Mickey's Great Outdoors DVD. US entries only and one entry per person. Winner will be chosen on June 4, 2011. **We received a complimentary Mickey's Great Outdoors DVD for review no financial compensation was received. Also just liked you on facebook!! I am a subscriber - Thanks! I like 24/7 Moms on FB - Thanks! My 3 year old would LOVE this! :)Thanks! I follow 24/7 Moms on Twitter! I am already a GFC follower (coliebear). Sophia saw this and said that I HAD to enter! I like on Facebook Cindy c.